You may or may not be familiar with this product line. 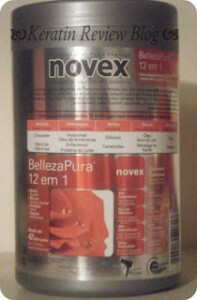 The Embelleze company’s Novex line has been a staple in Brazil. A few years ago they decided to bring their brand to the United States. Back then I was interested in their formaldehyde free Chocolate Brazilian keratin treatment. 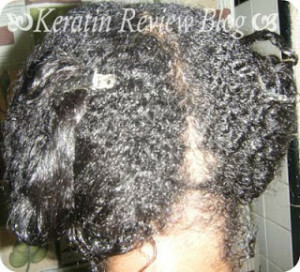 I never got around to trying it but I still wanted to try their deep conditioners. I thought they were a bit too expensive at about $20 dollars a pop. I didn’t know how well they would perform and there was no reviews on them anywhere. Recently i see that the prices have dropped in many beauty supplies due to poor sales. I thought this was a perfect opportunity to try a few of these “concentrated creams” to see if they were as good as they claimed. 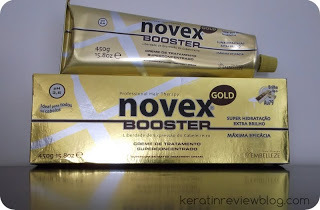 Here is the first one I tried and what initially led me to get hooked on “a linha Novex”…. For 10 bucks i was able to get 1 kg of product or 35 oz of product. That is a great value! The tub packaging is very pretty yet practical. 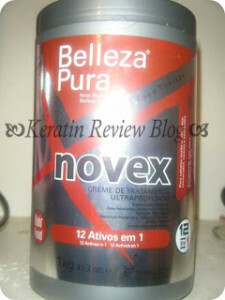 The glossy silver and red label is quite information dense and is in both Portuguese and English.It mainly outlines what makes this product special. Unfortunately, some of it is translated and some of it isn’t. I have to say that doesn’t sound too shabby! 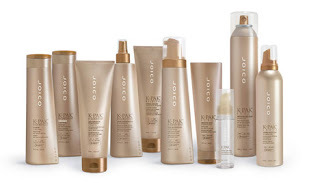 The full list of ingredients are: Aqua, Cetearyl Alcohol, Petrolatum, Zea Mays Starch, Cetrimonium Chloride, Butyrospermum Parkii Butter, Parfum, Hydrolyzed Keratin, Prunus Amygdalus Dulcis Oil, Glycyrrhiza Glabra (Licorice) Extract, Rose Extract, Chicory (Cichorium Intybus) Extract, Bertholletia Excelsa Seed Oil, Hydrolyzed Rhodophycea Extract, Menthol, Biotin, Panthenol, Phenyl Trimethicone, Methylparaben, Hydroxypropyltrimonium Honey, Linum Usitatissimum, Elastin, Hydrolyzed Collagen, Sodium Chodroitin Sulfate, Tocopheryl Acetate, Methylisothiazolinone, Methylchloroisothiazolinone. The product itself is a nice creamy consistency. It is slightly runny, but not thin at all. It smells like a grandma’s perfume which isn’t entirely awful depending on your tastes. The smell isn’t cloying or distracting so it doesn’t bother me at all. I washed my hair and decided to try this bad boy out. 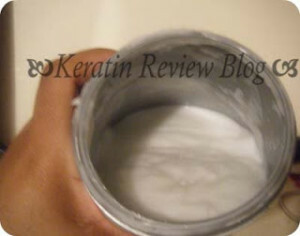 I have to say this stuff really went on smoothly.It had the perfect consistency for a deep conditioner. It wasn’t so runny it was dripping down my face but it wasn’t so thick that it felt like it just sat on my hair strands. I was a little worried because at first my hair felt like it was getting matted together once the product had started to absorb. FYI this was not an unusual occurrence. At this point of my transition, every time water hit it my hair became very tangled. After I let it sit for about an hour with heat, when I rinsed it out I was left pleasantly surprised. My tangles had melted away. 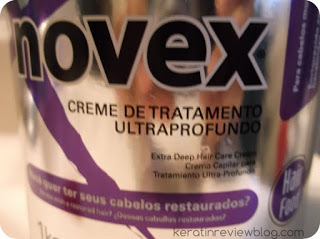 I usually would have had a mess on my hands but with this stuff my hair was so smooth and manageable. 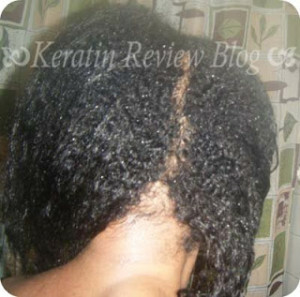 My fingers glided through my hair effortlessly! I was able to get away with just finger combing my hair. My hair was also visibly shinier, felt stronger and was less frizzy. A little later I tried using it as a leave in and it worked exceptionally well! 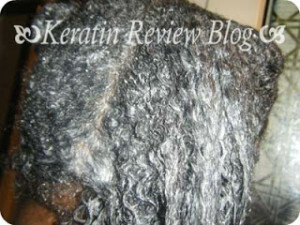 My waves were shiny and conditioned with no crunchy hardness or ashy residue! The results were too good to be true! It just had to be a fluke. But after using this several times, I just keep getting the same awesome results. I really like this product! After trying this I went out and bought a couple more products from this line. So far they have all worked really well! Look out for those reviews in the future! 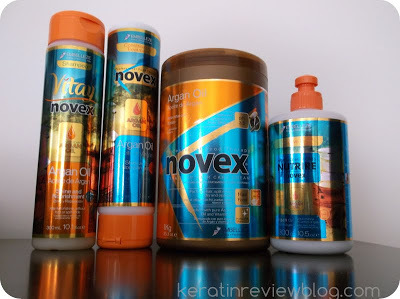 Has anyone else tried products from the Novex line? What do you think of them? « Next Generation Pressing Cream?! ?